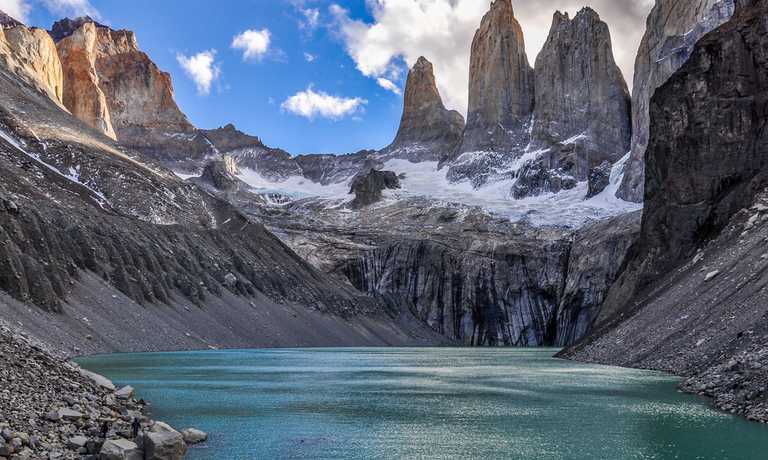 Combine wildlife with activity on this unique Torres del Paine trip, resting in hotels, hostels and camping. You will be actively looking for wildlife including, Rheas, Guancos and Pumas (if you're lucky), as well as having the chance to do some horse-riding and kayaking as well as trekking! Today you will arrive in Puerto Natales from El Calafate and have the afternoon free. You will meet with your guide today and take time to talk about the different adventures you will have over the following days! In the morning your guide will meet you and you will drive with him and a driver towards Cerro Castillo, which is about 1 hour from Puerto Natales towards Torres del Paine. On the way you will stop at a place called Milodon Cave. Here you will have a bit of time to get out walk to the cave, learn a bit about the history of this special location. After leaving the Milodon Cave area, you will stop in Cerro Castillo for a quick rest and about 35 kilometres later you will arrive at an Estancia where you will spend the night. Because this is an operating Estancia, we will try and get a visit to the places where they work with the farm animals in the evening, this is a large part of Patagonian history. Either way, you will take a short horseback ride in the afternoon. The horseback trip takes you into the valleys nearby Cerro Guido. You will have views of Sierra Baguales and Las Chinas, which are infrequently visited by tourists. You might see rheas, guanacos, hares, condors, foxes and many different types of birds. If you are lucky you might also see a puma during your ride. In the evening you will return to the Estancia and have dinner. 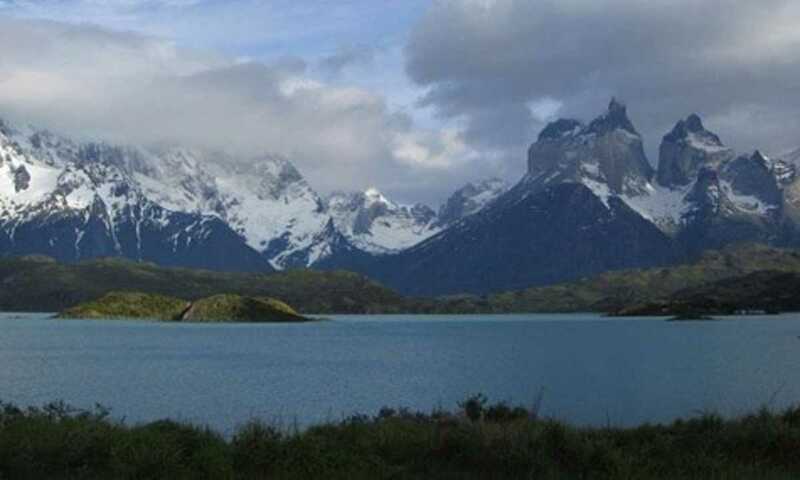 After breakfast, you will take a transfer towards the Laguna Azul sector just inside Torres del Paine. You start out hiking from Laguna Azul, on the east side of Torres del Paine. This is the same trail that Lady Florence Dixie mentions in her book, Across Patagonia. The trail is 19 km long; along the way you will cross numerous streams and creeks. You will see the famous Torres distinctly from many other tourists and enjoy the rolling hills. After lunch, you will head off towards a place we call Canadon Macho. The area is filled with Guanacos and we will be able to watch them in their different habits and meanwhile look for other animals in the area. You will stop in Laguna Amarga and walk around in different areas nearby where Pumas are normally seen. In the evening you will enjoy a night camping and dining at our base camp. After an early breakfast, you will begin to walk up Almirante Nieto, a mountain that takes you to an incredible view of Lake Nordenskjold and the Asencio Valley. You will arrive at Refugio Chileno a few hours before lunch. After a short rest in Chileno you will hike one hour through a dense Lenga forest. After leaving the forest, you will approach a moraine and climb to see the amazing granite peaks known as the Torres. After a bit of time admiring the view you will return back to Las Torres sleep and have dinner in your base camp. In the morning, with your guide you will cross the National Park, stopping along the way for views of Lake Nordenskjold and the Cuernos! After a short drive you will arrive at your destination, Camp Pehoe. From this campsite your guide will take you out to look for Pumas and birds that are found in this area. The day will be free without a real set itinerary, and your guide will take you to view wildlife and scenery in the Pehoe area. You will end the day camping in Camping Pehoe and eating a camp side dinner. After breakfast you will prepare to depart from camp. 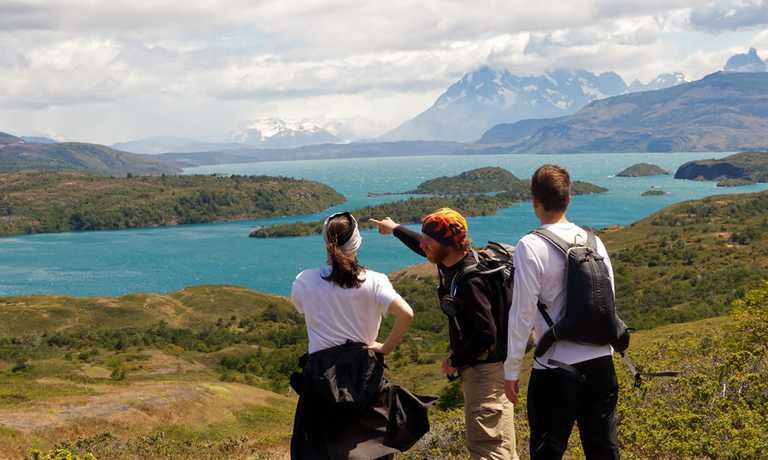 After breakfast you will continue towards the Grey sector of Torres del Paine and visit the Grey Beach, here you can take a walk of about 1 hour out to a lookout of Glacier Grey and a section of Lake Grey that is normally filled with icebergs. If you like you can take another hike up to a lookout of the area and perhaps find a huemul or take a boat ride on the Grey II in Lake Grey. Finally you will drive just outside of the national park to Pueblito Rio Serrano. You will spend the night here and enjoy different views of the Paine Massif. After breakfast in Rio Serrano you will meet up with your kayak guide, who will give you instructions to ensure a safe and comfortable trip. You and your guide will load the kayaks with the necessary equipment. Just after noon, you will begin paddling towards the Serrano waterfall. Once you reach the fall you will need to take a short walk and portage the kayaks to avoid the waterfall. Here your guide will set up camp and prepare a delicious dinner. In the morning you will continue your trip on Rio Serrano until arriving at Puerto Toro. Here you will leave your kayak and walk 35 minutes to see Serrano Glacier at the foot of Mount Balmaceda in Bernardo O'Higgins National Park. Upon returning to your kayaks, you and your guide will load them onto a larger boat (21 de Mayo) that will take you to Puerto Natales. Before arriving you will stop at a typical Chilean farmhouse for lunch. After lunch, you will continue on to Puerto Natales in a motorboat. Today you will take a bus to Punta Arenas and continue your journey home or to your next destination! The bus can drop you off at the airport or in the city. Departures can be set up on a date of your choice, subject to availability, for a minimum of 2 people. This trip can run as a group trip, with prices starting from $3,004 per person for a complete group. If you are looking to join a group or you are a solo traveller we will help to form likeminded groups of travellers. Please let us know your travel plans.